COCOA BEACH, Floirda -- According to event planners, segments of Minutemen Causeway (between Brevard Avenue and the "Beach End" of Minutemen Causeway) will be blocked off on Thursday, May 17, 2012 starting around Noon-time through 10:00PM to make room for a downtown "Super Boat" display area. Similar to last year's pre-Super Boat Race event, a number of these boats will be displayed on May 17th in the downtown area. 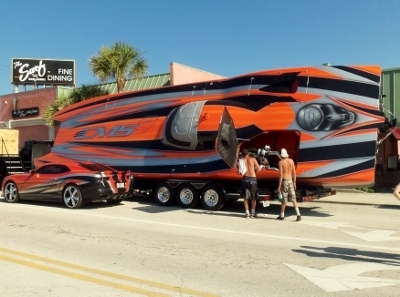 The main "Super Boat Race Event" is scheduled to take place off-shore over the May 19-20th weekend along Cocoa Beach. Due to the expected traffic congestion in the downtown area on the evening of May 17th, the location of the scheduled City Commission meeting has been changed to the Cocoa Beach Golf Club Auditorium, starting at 7:00pm.